Flowers add a bit of magic to any occasion. They have the power to transform a room, a spirit, and an occasion. Some flowers that we think are most transformational can make gorgeous centerpieces on your fall party table. The perfect flowers for a fall party include those that evoke emotion and create a sense of warmth. They’re flowers in rich hues and dramatic lines. The ideal fall flowers for a party make people take notice of their beauty, which begins the shift to the magical side. Here are some of our favorite flowers for a fall party. These flowers look gorgeous, and will bring cheer to your fall celebration, on their own or in an arrangement. 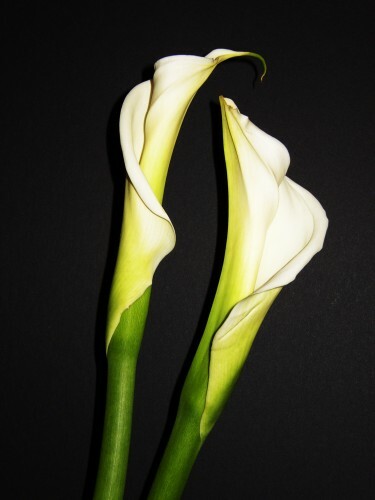 Cala lilies are stunning and sophisticated flowers. They come in many shades, including green, purple, yellow, white, and orange. But, for fall we love them in white or orange. Calla lilies are native to Southern Africa. You can get them cut or in bulb form. For fall party flowers that speak of friendship and good times, choose Peruvian lilies. These blooms are flirtatious and festive. They’re playful, making them great fall flower choices for a daytime affair. Peruvian Lilies are native to South America. They come in brilliant colors like yellow, pink, orange, and white. For fall, opt for orange and white. If you want a fall party flower that’s dramatic, go with the red Asiatic Lily. This flower is characterized by its large, very showy and very fragrant bloom. It comes in many shades, but red is striking and perfect for fall. Red Asiatic lilies are gorgeous for evening occasions. They sit atop tall, erect stems and offer a beautiful trumpet shape that is just right for the season. In addition to these fall flowers, we love rich burgundy carnations, fall-colored roses, and peach Asiatic lilies for fall gatherings. You can pair these flowers with rich, lush greens like seeded eucalyptus. Flowers add a bit of magic to any occasion. They have the power to transform a room, a spirit, and an occasion. Some flowers that we think are most transformational can make gorgeous centerpieces on your fall party table.The perfect flowers for a fall party include those that evoke emotion and create a sense of warmth. They’re flowers in rich hues and dramatic lines. The ideal fall flowers for a party make people take notice of their beauty, which begins the shift to the magical side.